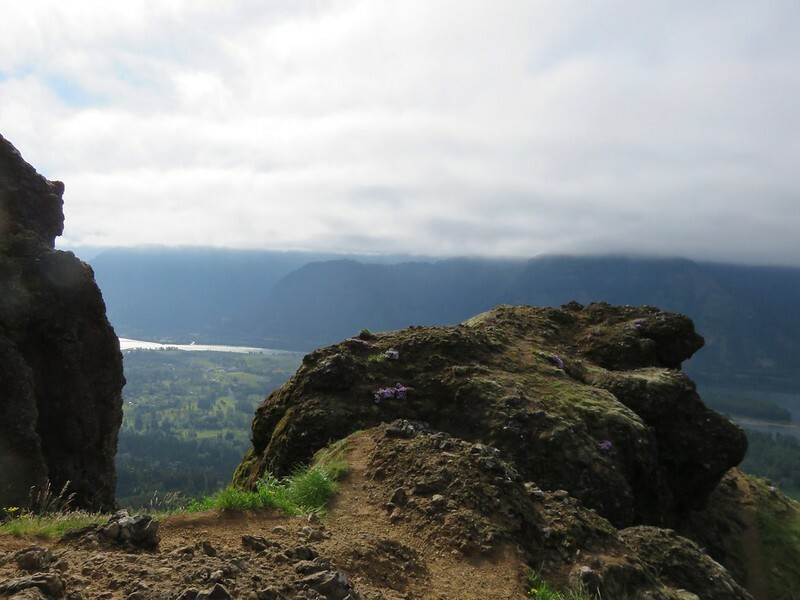 Almost two years ago we traveled to Beacon Rock State Park to hike the Hamilton Mountain Trail. 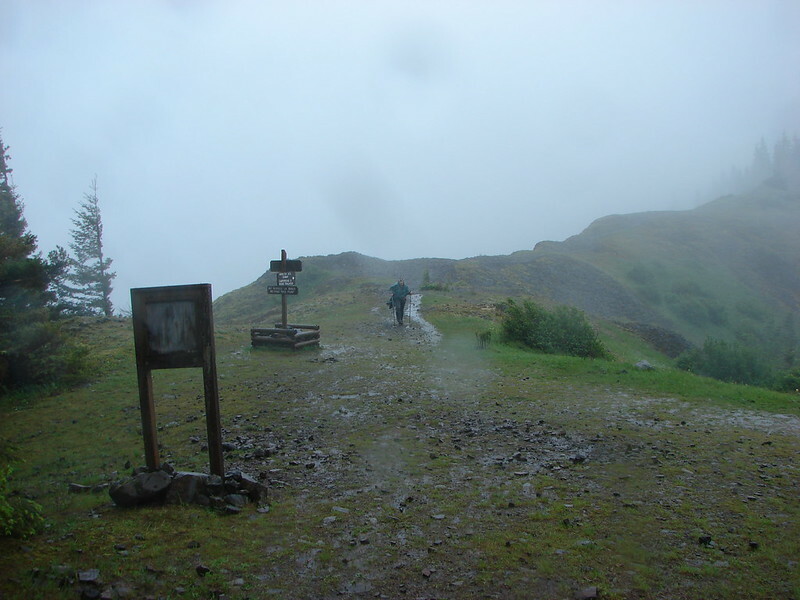 https://wanderingyuncks.wordpress.com/2013/05/ It was and still is the worst weather that we have ever encountered during a hike. 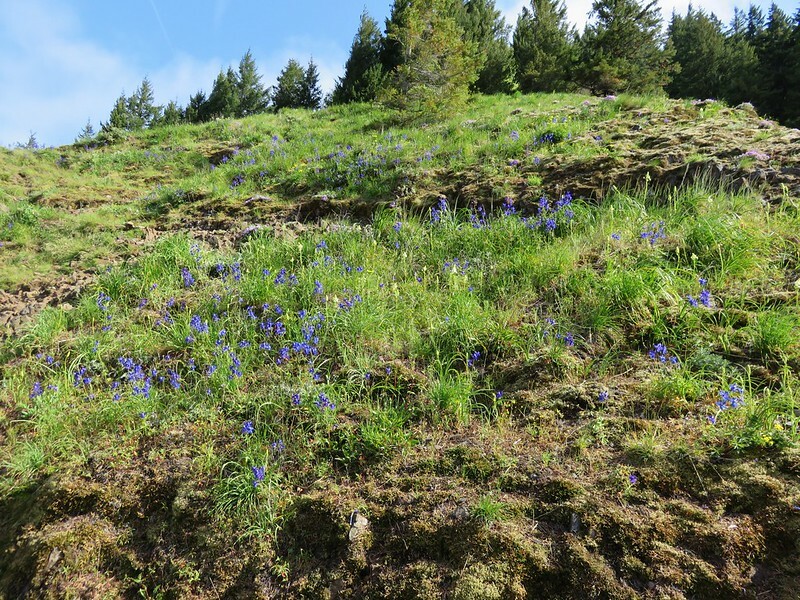 Well enough time had passed and it was time for us to give this hike a second chance. We double checked the weather forecast before heading out which showed some morning clouds clearing up by mid-morning with little to no chance of rain and calm winds. That was good enough for us to give it a go so we got in the car and headed up to the Columbia Gorge once more. 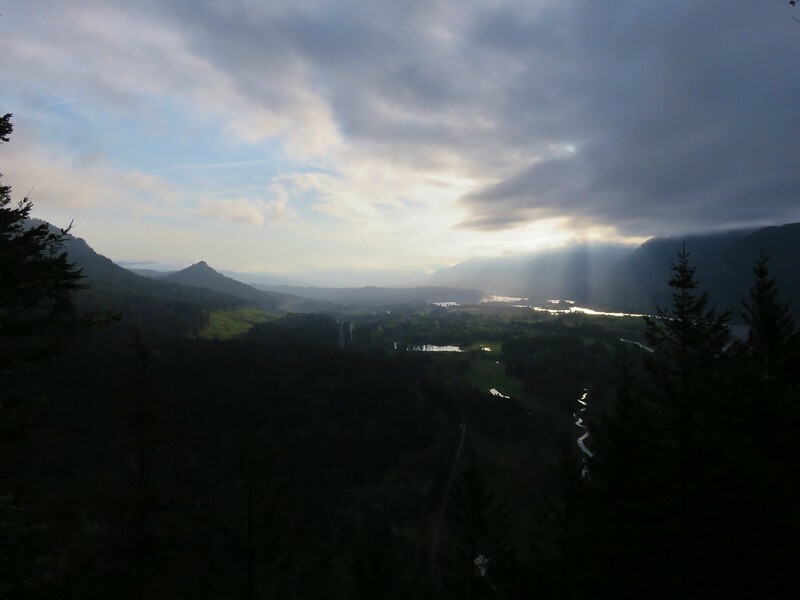 For most of the drive we were under a solid mass of clouds but as we headed east along Highway 14 toward Beacon Rock State Park rays of sunlight were shining down on the Columbia River in the distance. 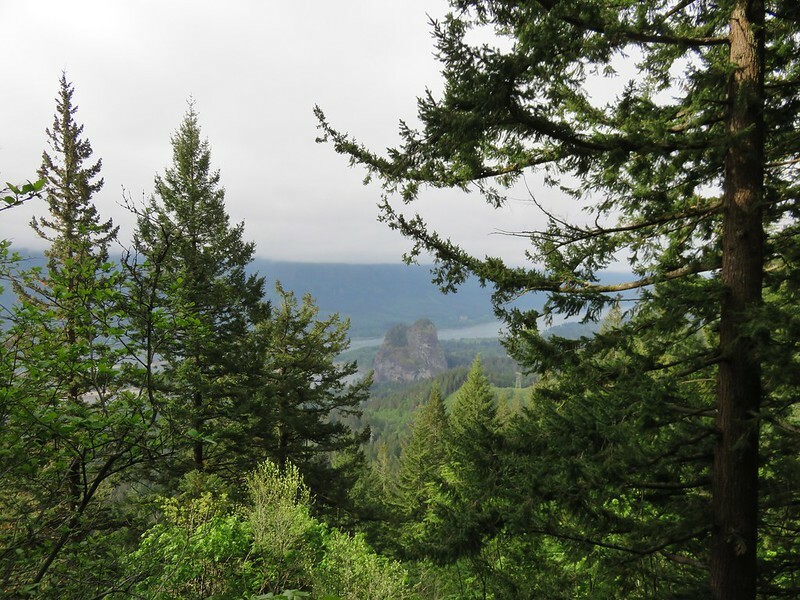 The edge of the clouds was just a bit further east than Hamilton Mountain so we decided to warm up on another trail in park, the .8mi Beacon Rock Trail, hoping to give the clouds more time to lift. 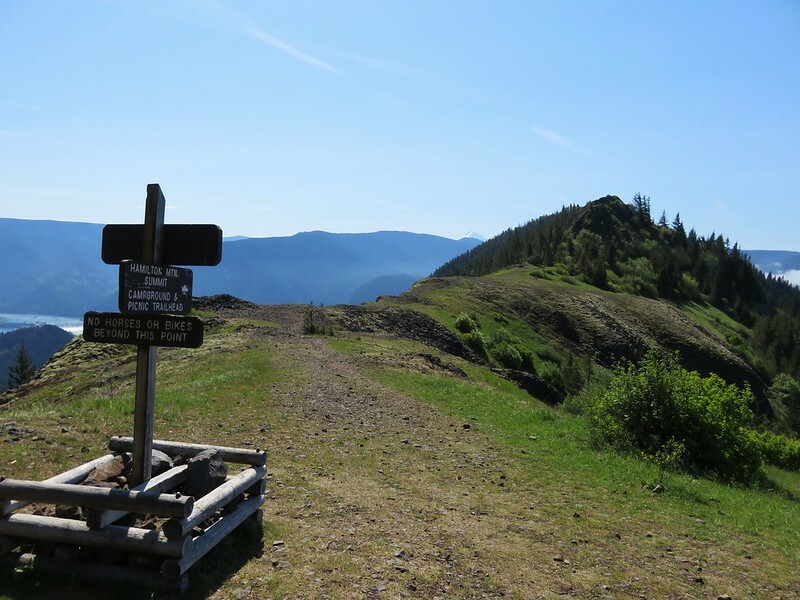 Parking for this trail is right along the highway and requires a Discovery Pass which can be purchased at the trailhead (currently $10/a day per vehicle). 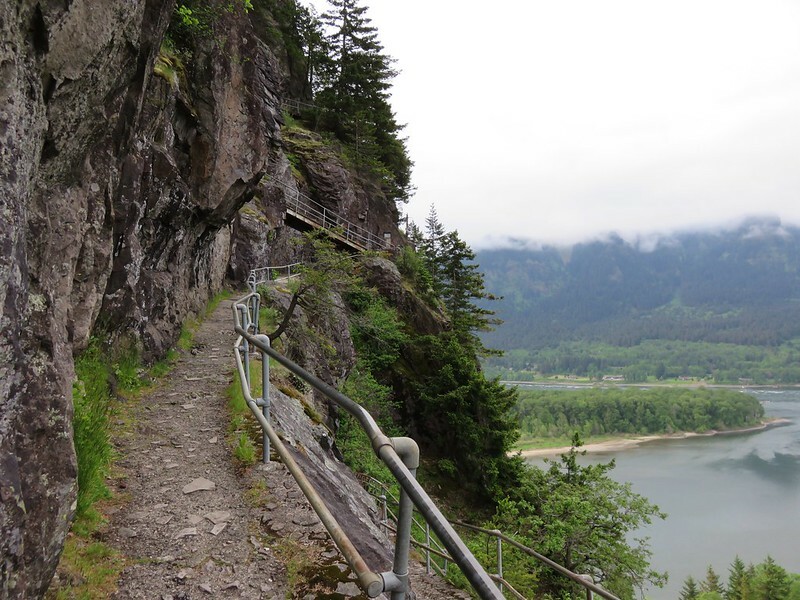 The trail begins almost directly below Beacon Rock itself. 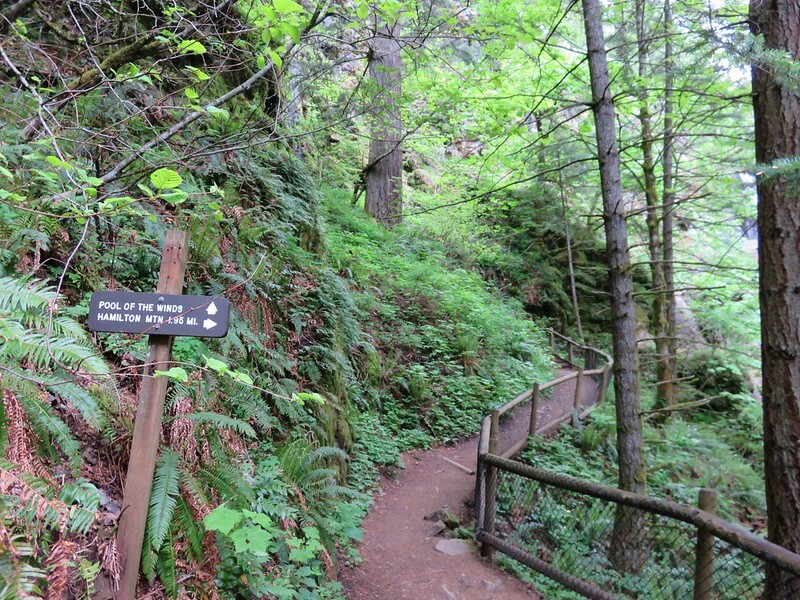 After a very short walk through woods the trail begins to switchback up Beacon Rock. 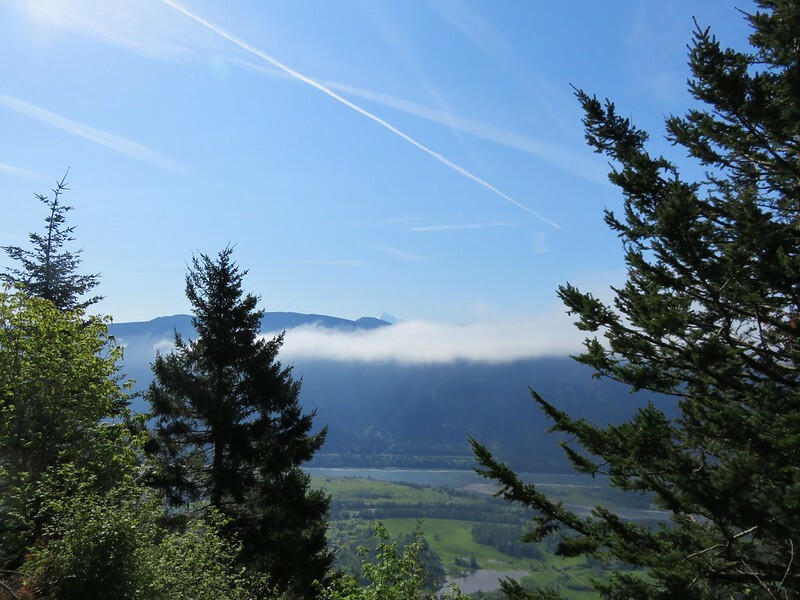 When we reached the summit the edge of the clouds was still to the east above Bonneville Dam. We could also see that Hamilton Mountain still had a cloudy top making us wonder what the conditions would be by the time we got up there. 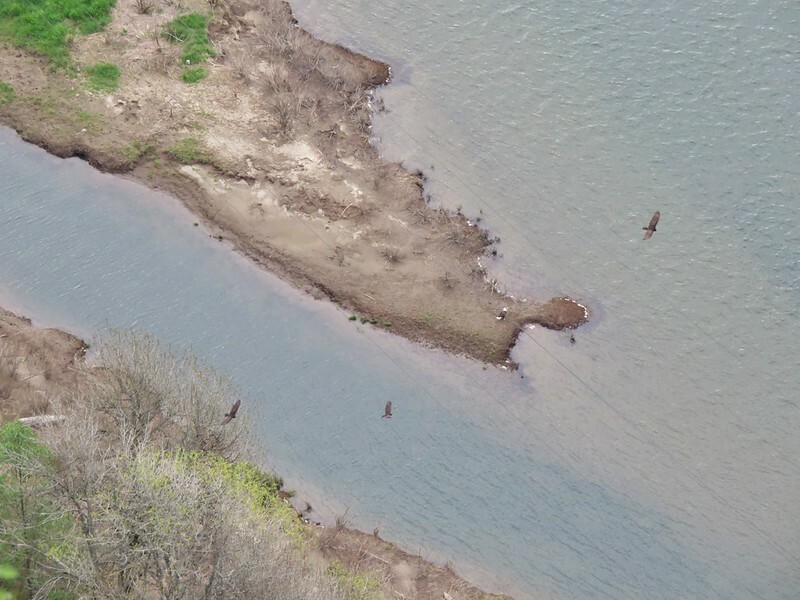 On the way back down we watched a number of Turkey Vultures circling above the river as well as a lone Bald Eagle. After completing our warm-up we hopped back in the car and crossed the Highway following a campground sign to the trailhead parking area. The trail sets off at a signboard behind the restrooms. 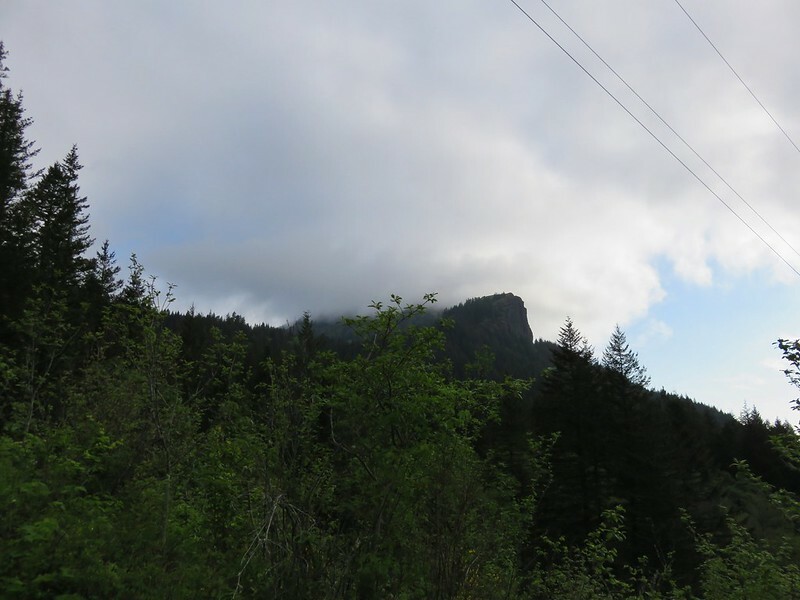 After a gradual .5 mile climb through forest the trail emerges to views of Hamilton Mountain from under some power lines. The summit was still in the clouds but they did seem to be breaking up and we still had over 2.5 more miles to climb before reaching the top. 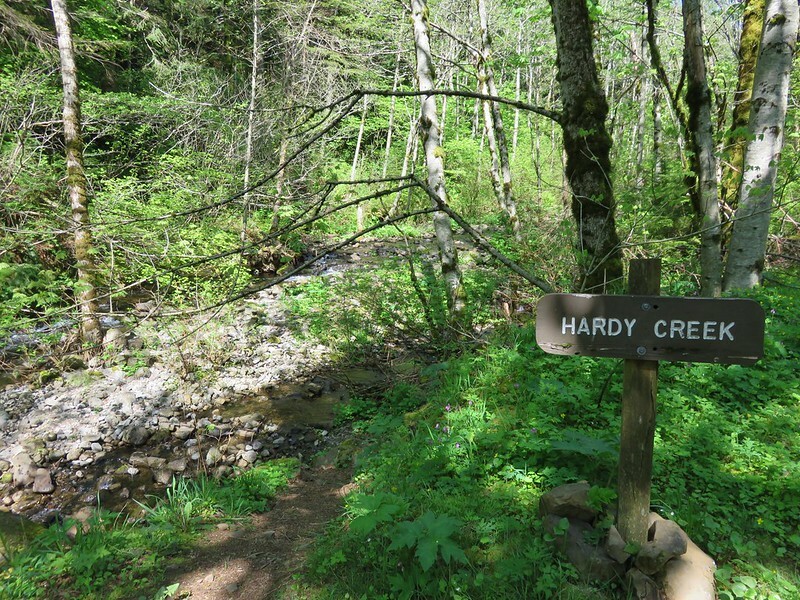 After another half-mile a sign announces a viewpoint for Hardy Falls. 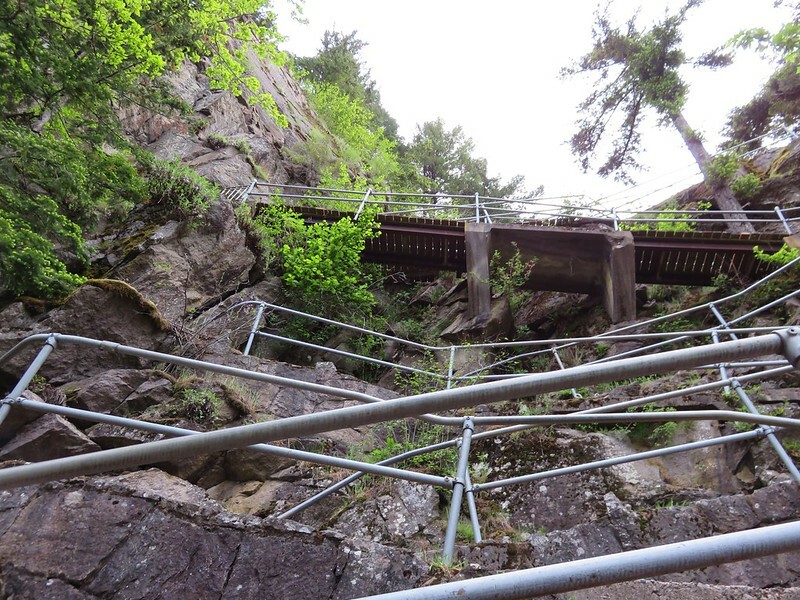 A narrow path leads down a ridge to a platform that has no view of Hardy Falls at all. The only views are along the ridge prior to reaching the platform, and they are not great. 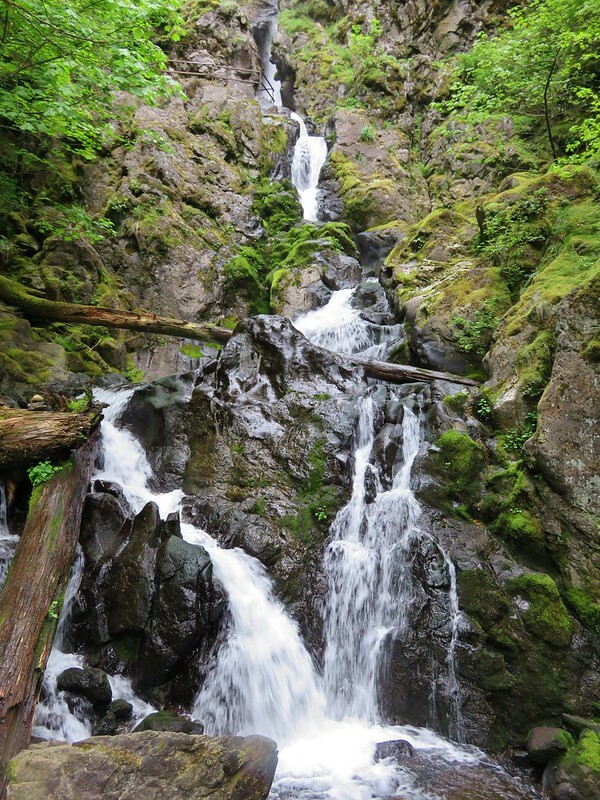 The disappointing viewpoint of Hardy Falls is quickly forgotten after just another tenth of a mile on the trail. Here another sign points up to Pool of the Winds. 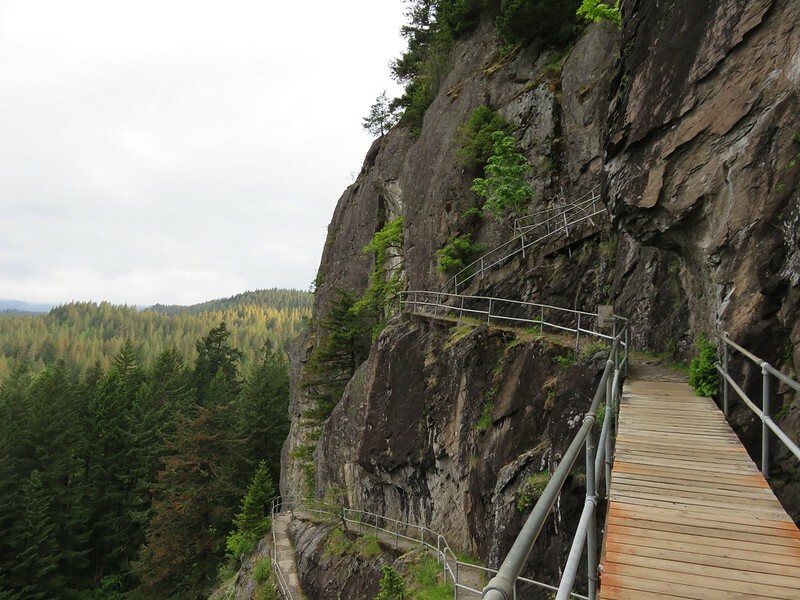 This short path leads to another railed viewpoint, but this time there is really something to see. 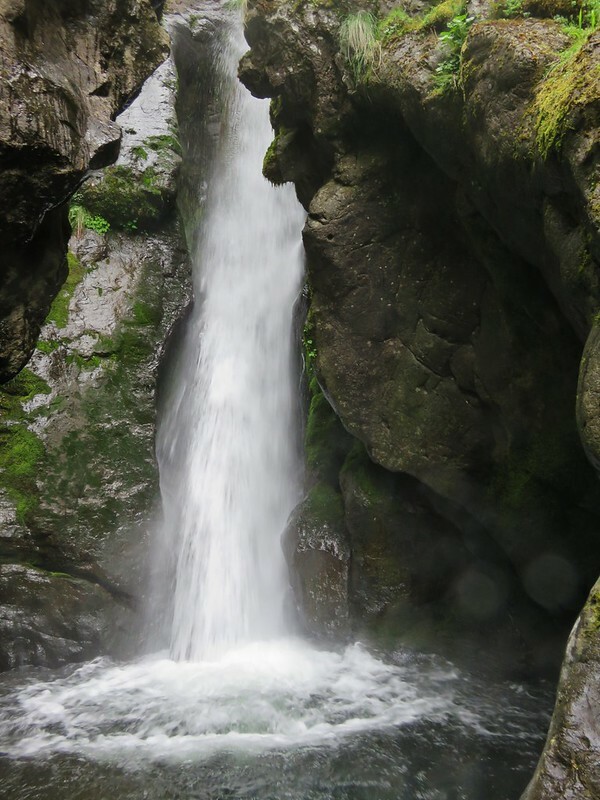 The upper portion of Rodney Falls splashes into a rock enclosed splash pool. The force of the water falling into the pool combined with the narrow opening in the rocks causes wind to funnel out giving the pool its name. 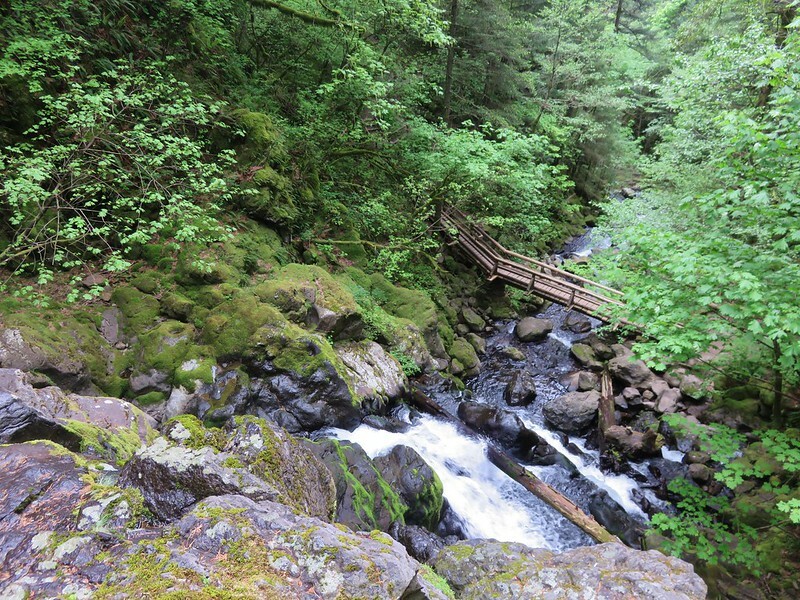 The view down is also nice as the trail crosses the creek on a footbridge below Rodney Falls. 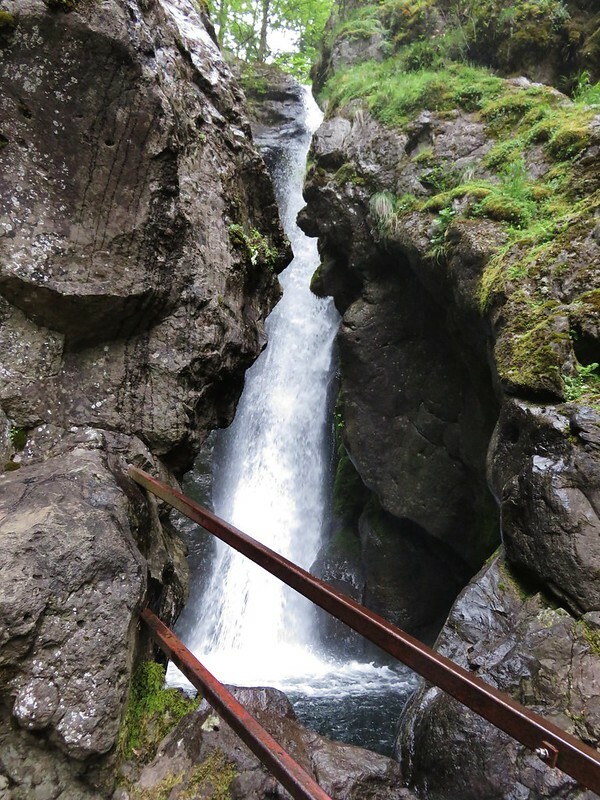 After spending some time enjoying the pool we continued on the trail passing below the falls. 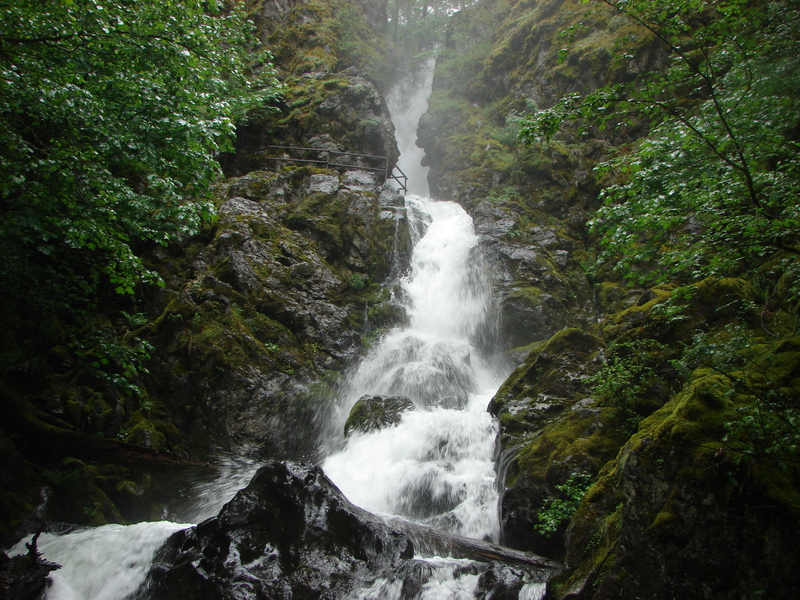 Rodney Falls is one of the more complicated falls we have seen. With the Pool of the Winds at the top followed by several smaller sections and then fanning out at the bottom it just has a lot going on. It also changes directions a couple of times which makes it difficult to capture it all well in a photo. 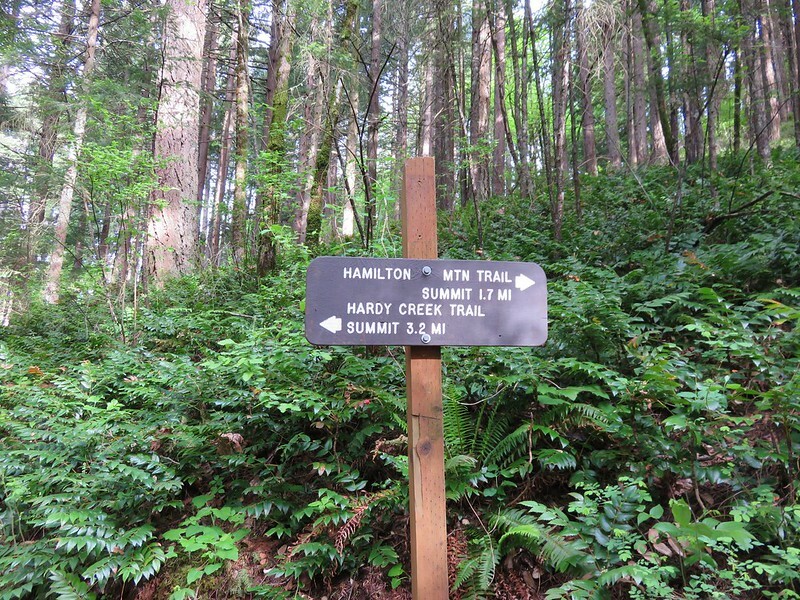 Just over a quarter mile from Rodney Falls the trail splits allowing for a loop over Hamilton Mountain. We headed right which is the shorter but steeper way to the summit. 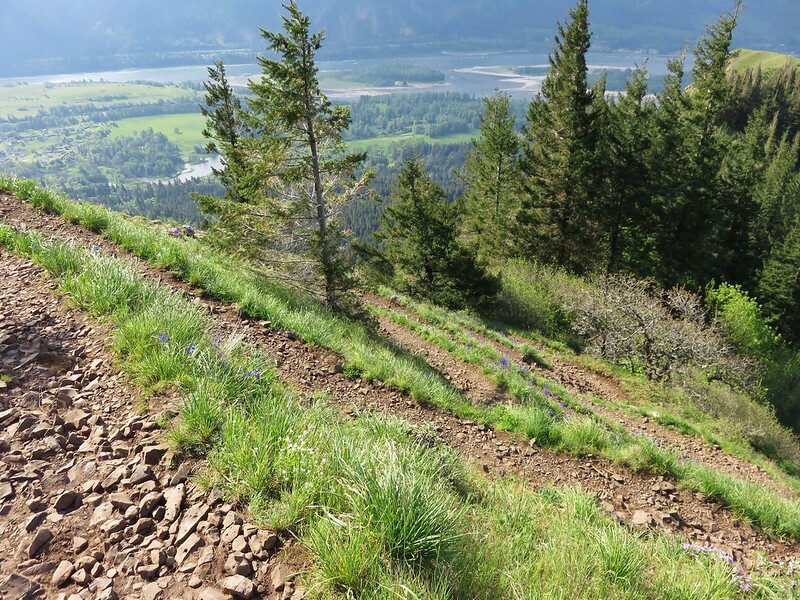 We tend to prefer to go up rather than down steeper trails because it’s easier on our knees. Heading up the right fork the trail passes an increasing number of meadows where we were met with views and wildflowers. In 2013 the views consisted almost entirely of clouds so much of this we were seeing for the first time. Beacon Rock from the trail. 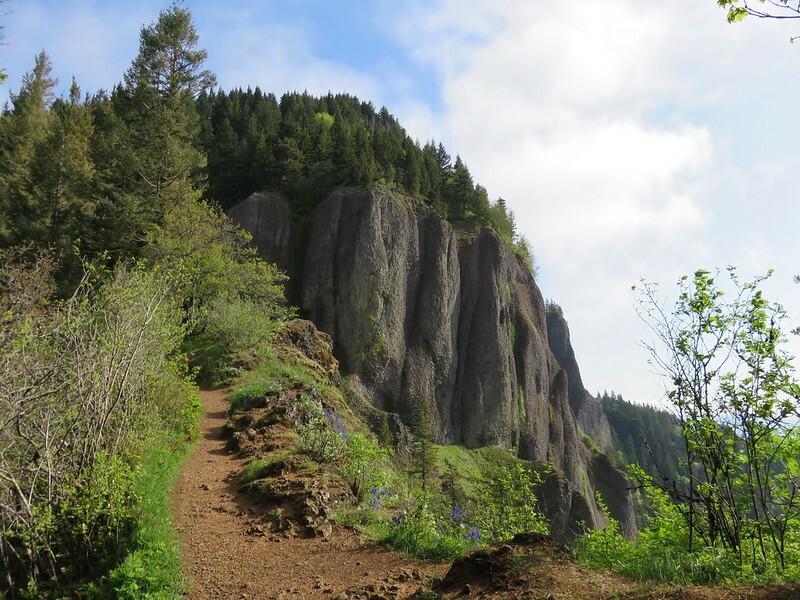 A side trail to the right leads to a rocky outcrop with even more views. 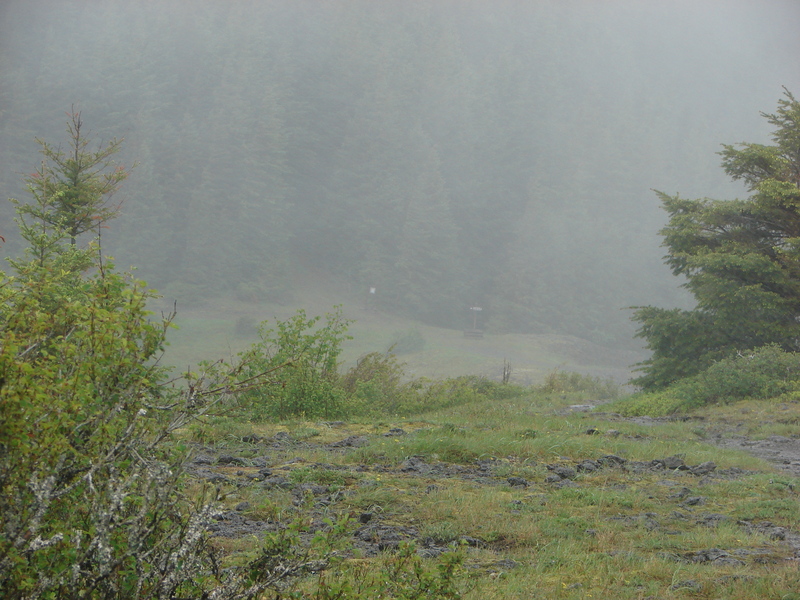 Then the trail passes behind a knoll where more trees await. After making its way around the knoll the trail crosses a ridge between the knoll and Hamilton Mountains summit which looms ahead. 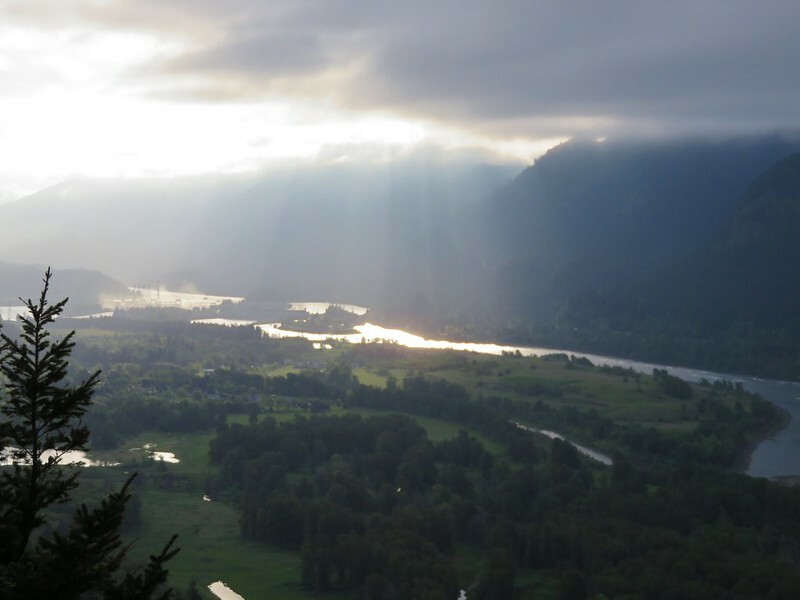 The view of the Columbia River along this ridge is very nice. 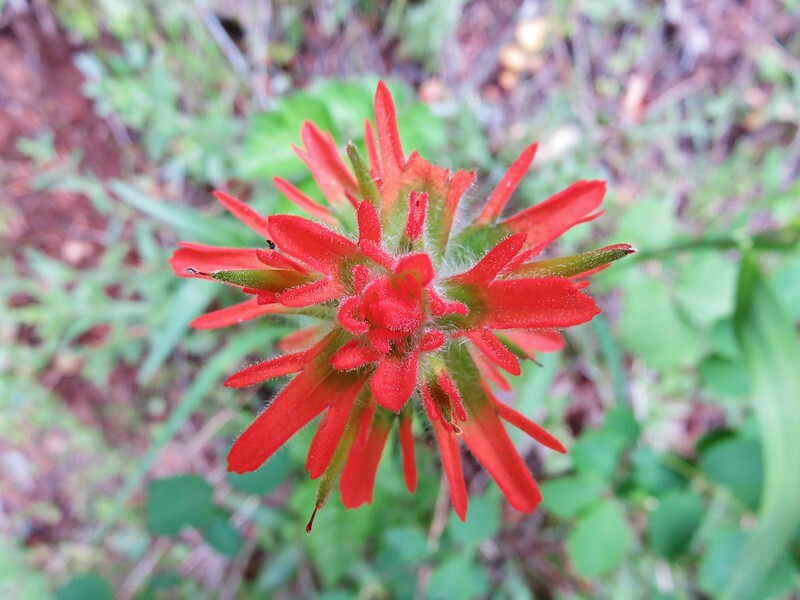 The trail then begins its final ascent switchbacking up through open meadows of flowers. 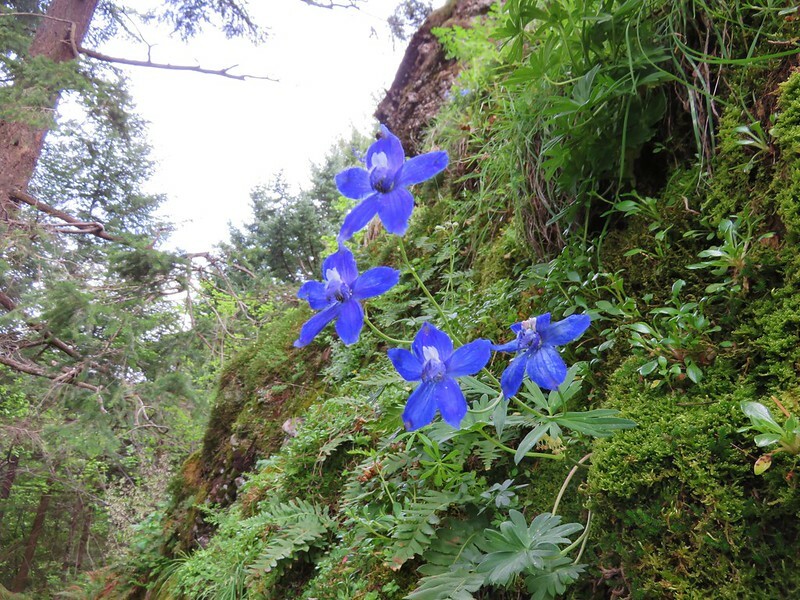 Larkspur and Chocolate Lilies were the predominate flowers blooming at this time of the year. As we continued to climb the clouds continued to burn off and Mt. Hood suddenly appeared across the river. 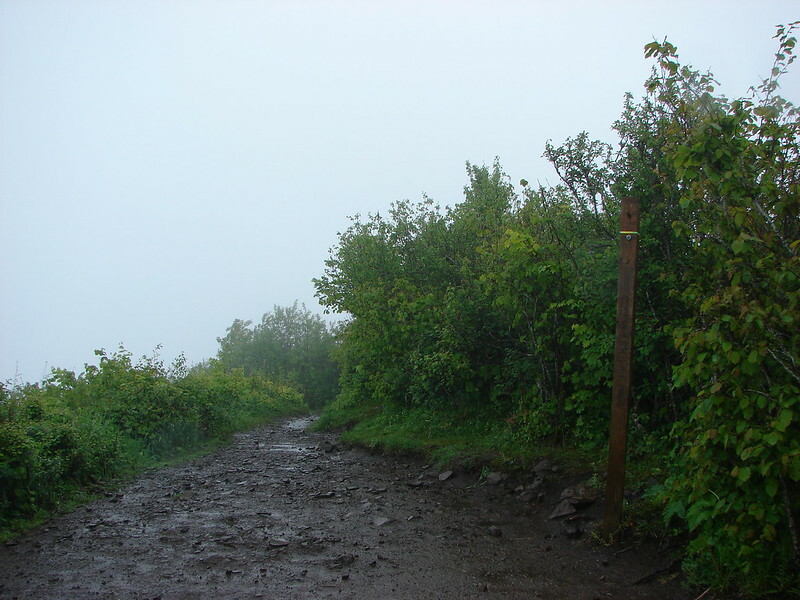 To reach the actual summit take a side path to the right near the top of the mountain. Here the view was vastly different from our previous visit. 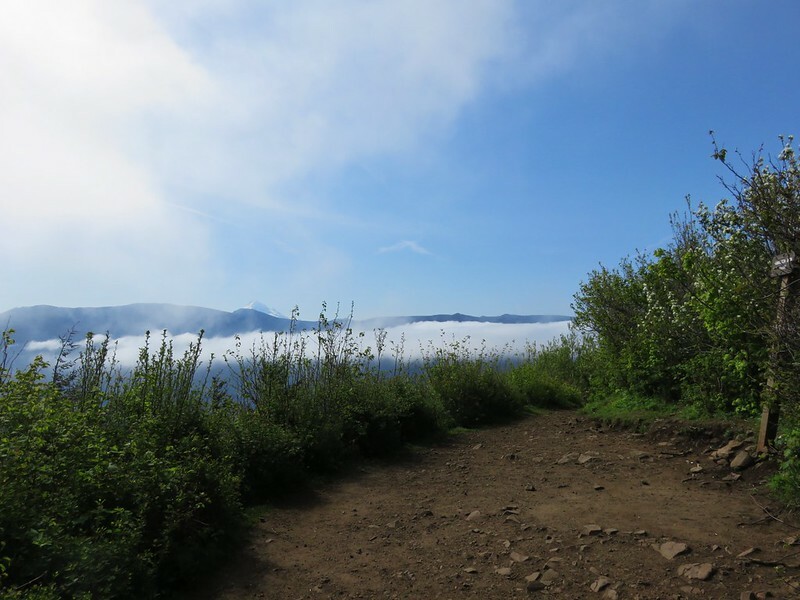 There were only a few bands of clouds left when we arrived at the summit and in addition to the view of Mt. Hood to the south Table Mountain and some of Mt. Adams were visible to the east. We took a short break and watched the clouds as they passed by. 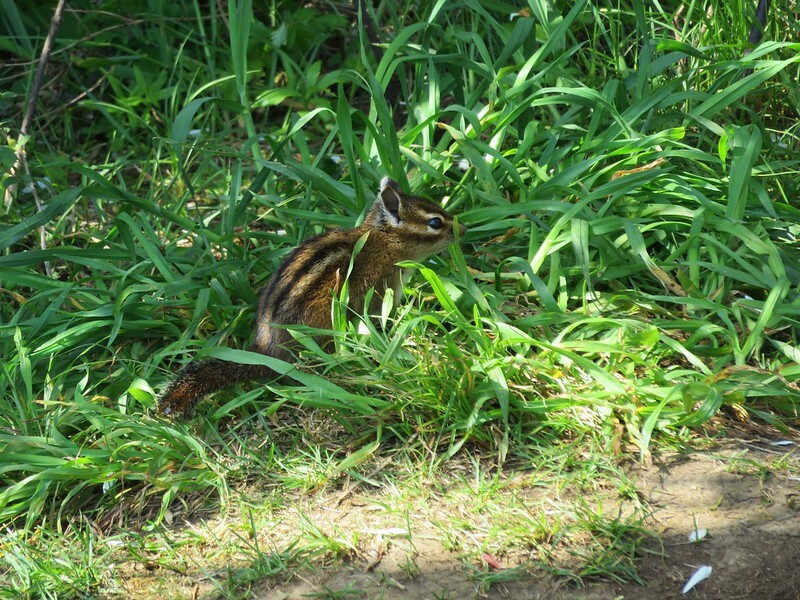 A few hikers and some other critters kept us company. We continued on the loop looking forward to reaching an exposed ridge that was the site of my infamous poncho battle in 2013. 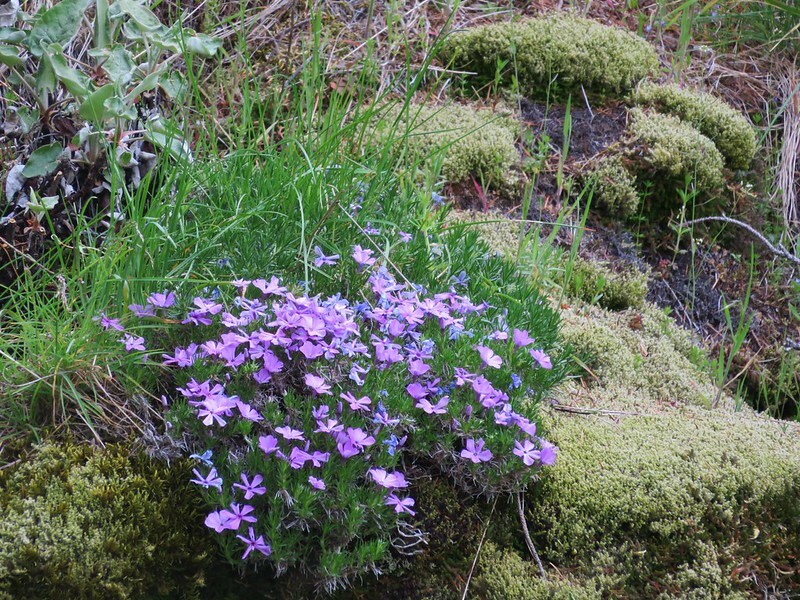 Wind and rain were whipping up and over the ridge on that visit but this time it was just sunshine and flowers. At the far end of the ridge we looked back to soak in the view that we missed the first time. Several paths lead off from the far end of the ridge, but we simply took a sharp left and headed down an old road toward Hardy Creek. The road leads downhill for a mile to Hardy Creek. 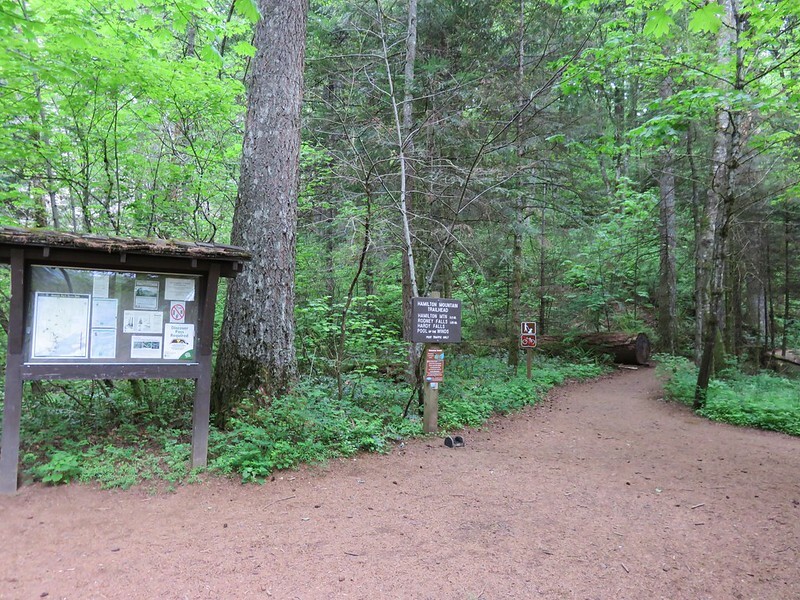 Signs at Hardy Creek point to the 1.1 mile hiker-only trail that completes the loop .3 miles from Rodney Falls. 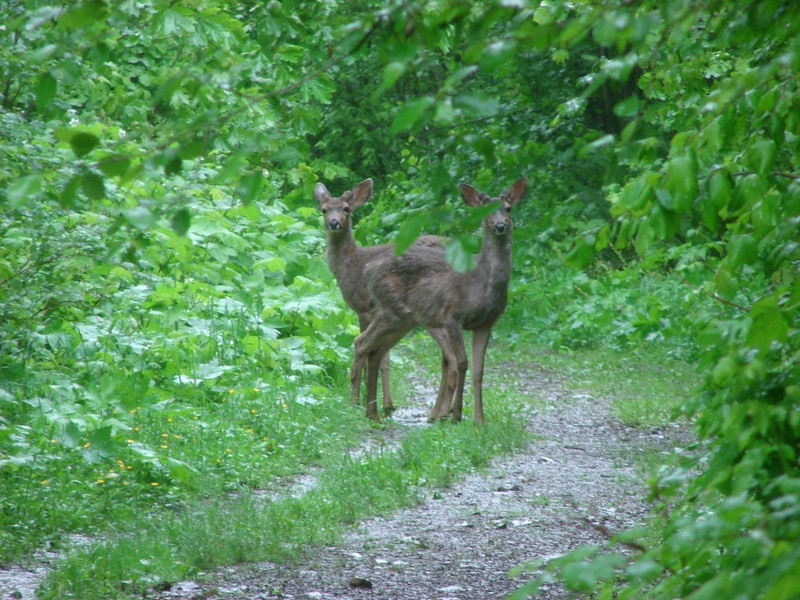 By the time we arrived back at the falls a steady stream of people were coming up from the trailhead. We were once again glad we’d gotten an early start and made our way past a traffic jam at the footbridge. 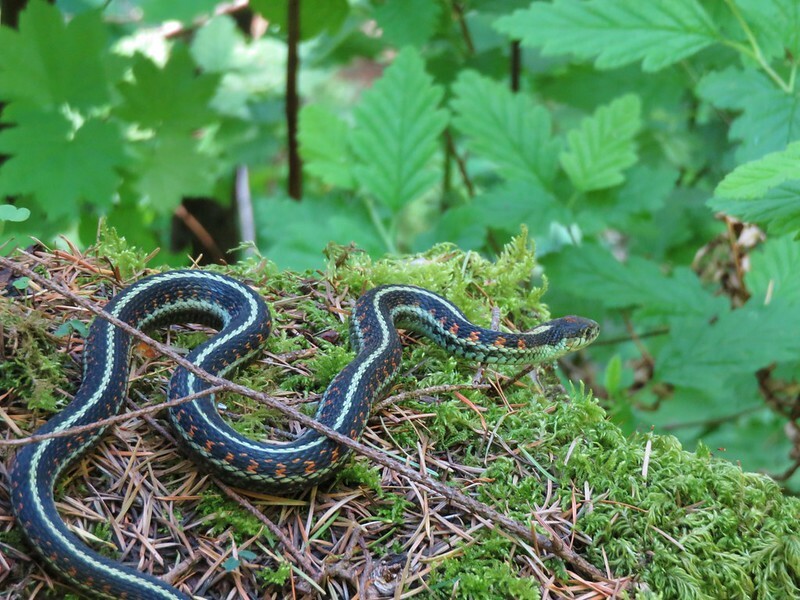 With the number of hikers and dogs coming up the trail we were surprised when Heather spotted a garter snake on the path. 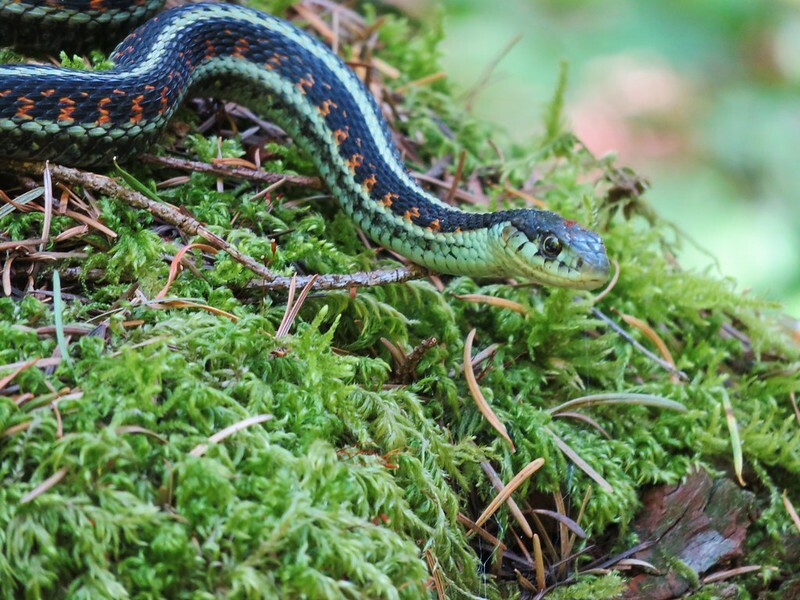 It took cover in a stump but then came out to take a closer look at us. We were really happy with the way this hike turned out. 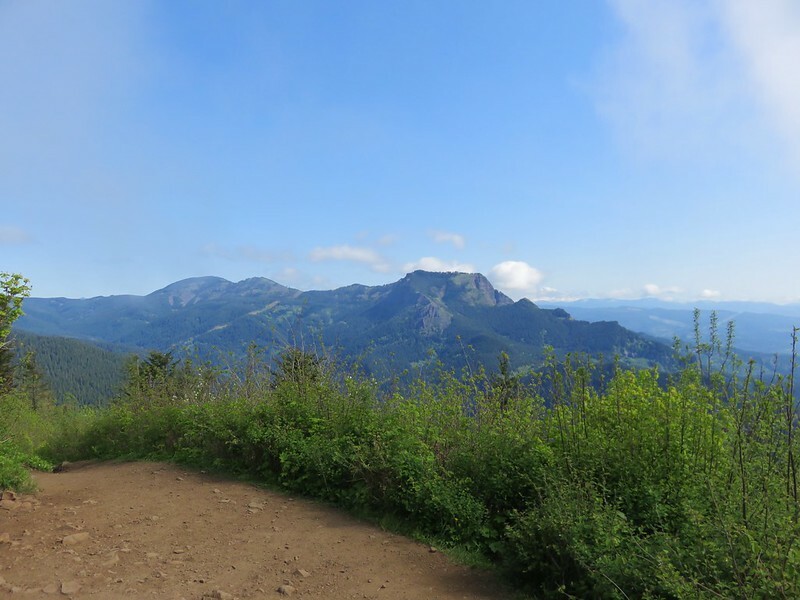 We had gotten the views we’d missed out on during our previous visit and the Beacon Rock warm-up was entirely new. Another great day in the Pacific Northwest. Happy Trails! If at first you don’t succeed, try, try again. After our recent string of cloud obscured views I was determined to break the streak. I had been watching the weather forecast all week and decided everything was lining up perfectly for a return to the Columbia Gorge and another attempt at a view of the Cascades. The nasty weather and the poncho attack on Hamilton Mountain needed to be avenged so for this hike I picked Table Mountain. 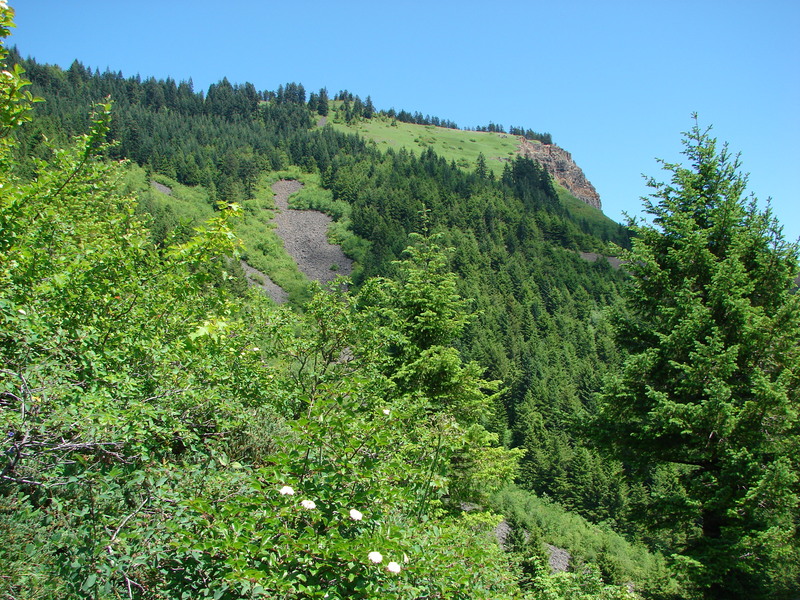 Table Mountain is located less than 5 miles east of Hamilton Mountain. It should have been what I was looking at from the saddle when I was sucker punched by the poncho during that hike. 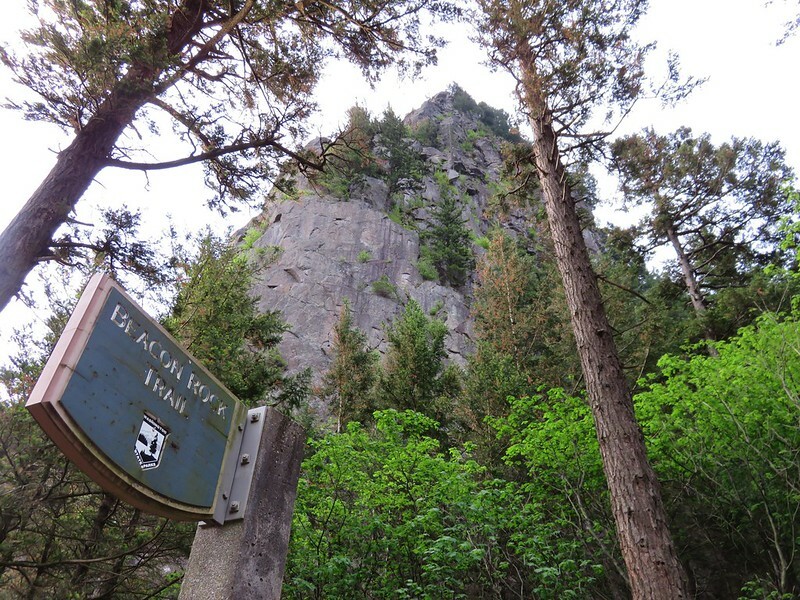 Much of Table Mountain collapsed into the Columbia River centuries ago leaving dramatic cliffs on the south face. With an elevation of 3417′ it is nearly 1000′ taller than Hamilton Mountain so the potential for views is great. We woke up to a beautiful sunny morning but as we approached Portland an ominous cloud hung to the east of the city. The skies all around were blue and we hoped that Table Mountain was far enough to the east to be clear of the cloud. 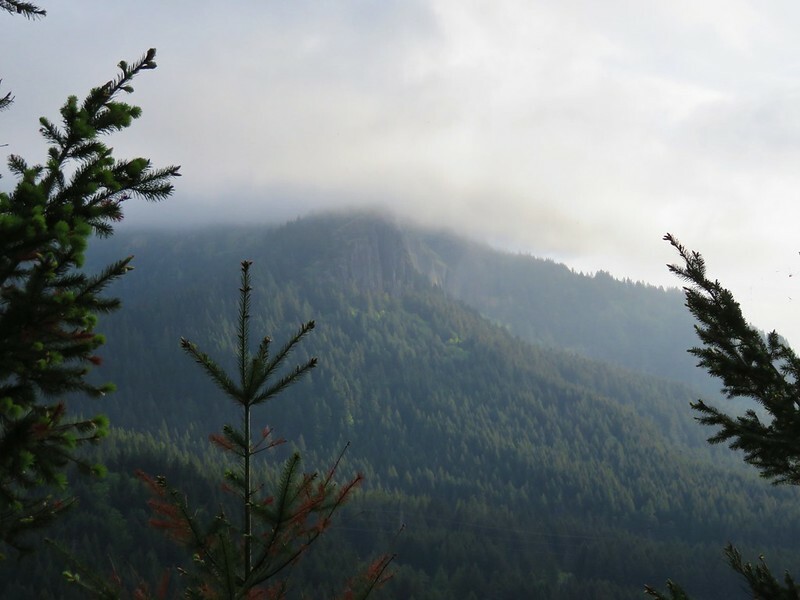 We formulated a plan b just in case when we reached Hamilton Mountain which was once again covered in clouds, but when we arrived at the trail head behind Bonneville Hot Springs the summit of Table Mountain was cloud free. With blue skies to the north and east we decided to give it a try. 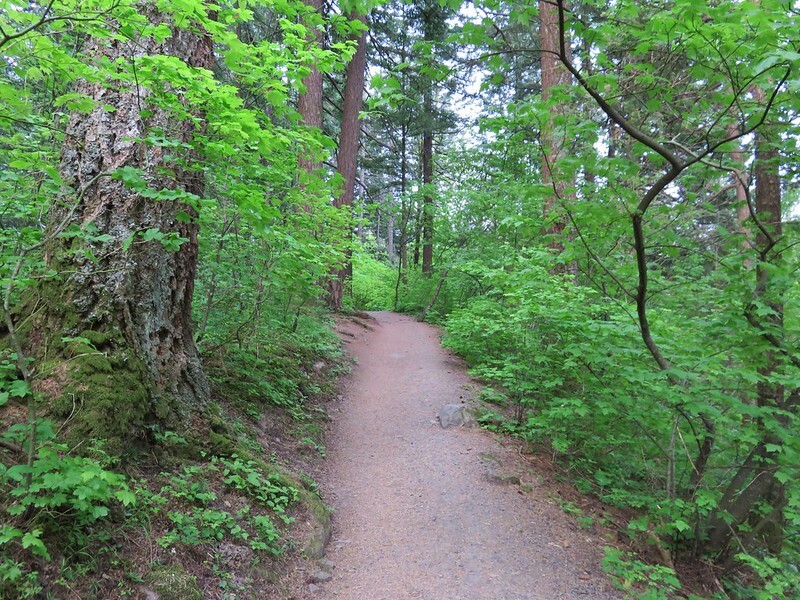 The first 2.2 miles of the trail pass through a pretty forest, first on a volunteer created trail, then following an old road up to the Pacific Crest Trail (PCT). 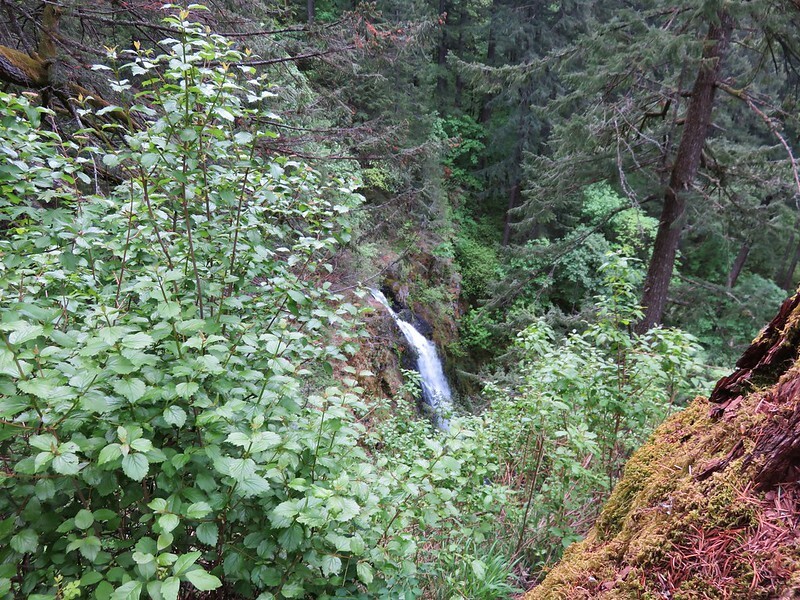 This first section was nice but unremarkable although we did come across some ripe salmonberries to sample. After a short walk on the PCT we reached the sign for the loop trail to the summit of Table Mountain. 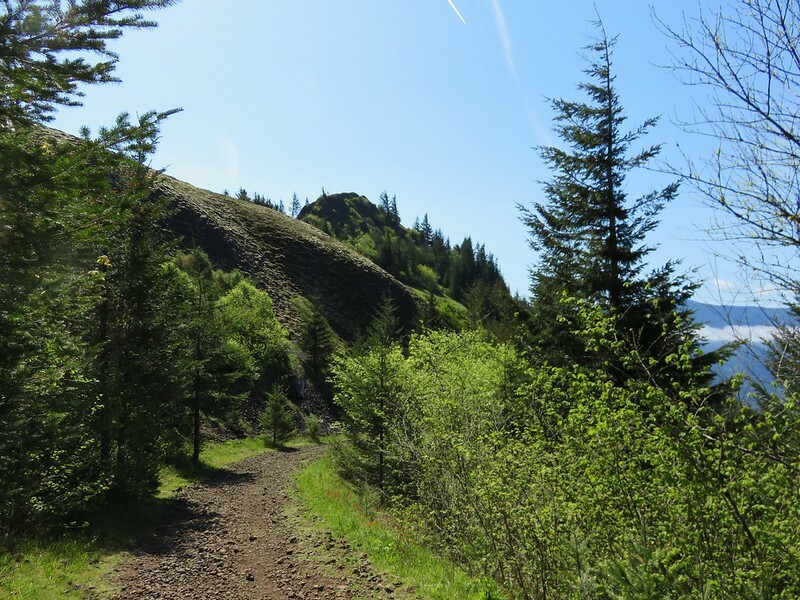 The aptly named Heartbreak Ridge Trail gains 1770′ in 1.5 miles. In order to do this the trail heads up with a vengeance. 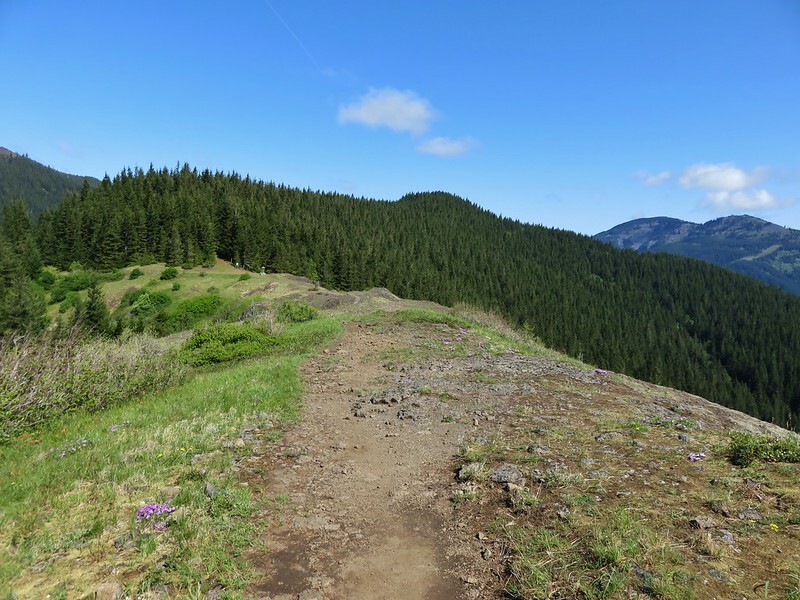 After 0.6 miles (and 800′ of elevation) the trail arrived at a saddle viewpoint. To my dismay the clouds that had been to the west were now heading east obscuring much of the view and had now covered Table Mountains summit. 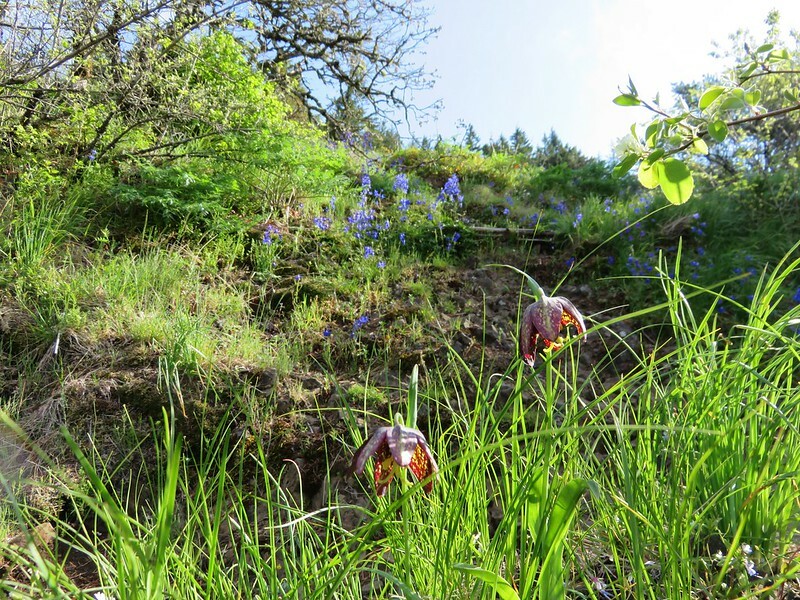 The trail then dipped down to the base of a 500 yard long rock slide where we spotted our first beargrass bloom of the year (on a hike not from the car). 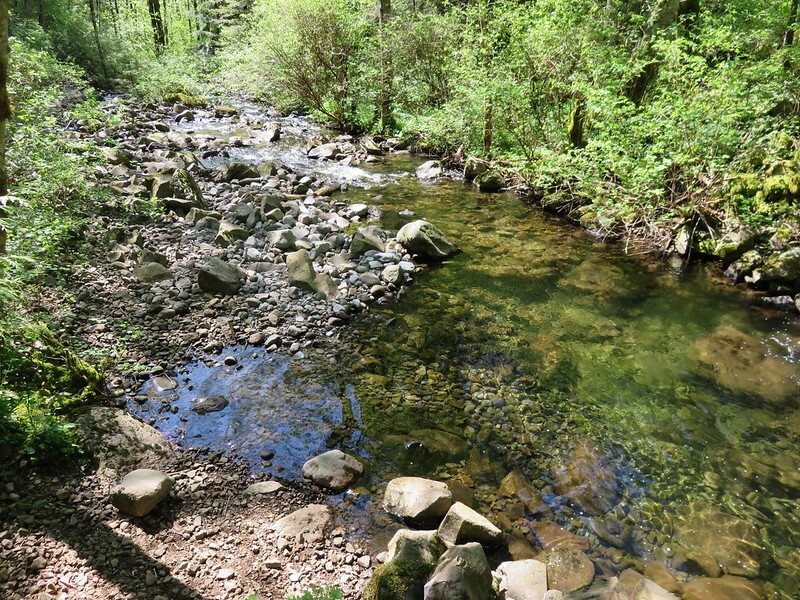 The trail appears to end at the rock slide but the rocks are the trail. Following poles we scrambled up the rocks to the continuation of the trail. This part proved to be quite fun. Just a few tenths of a mile after reaching the trails continuation we reached the meadows on the summit. An all to familiar view greeted us here. We had come all this way and couldn’t see more than a few hundred feet due to clouds. 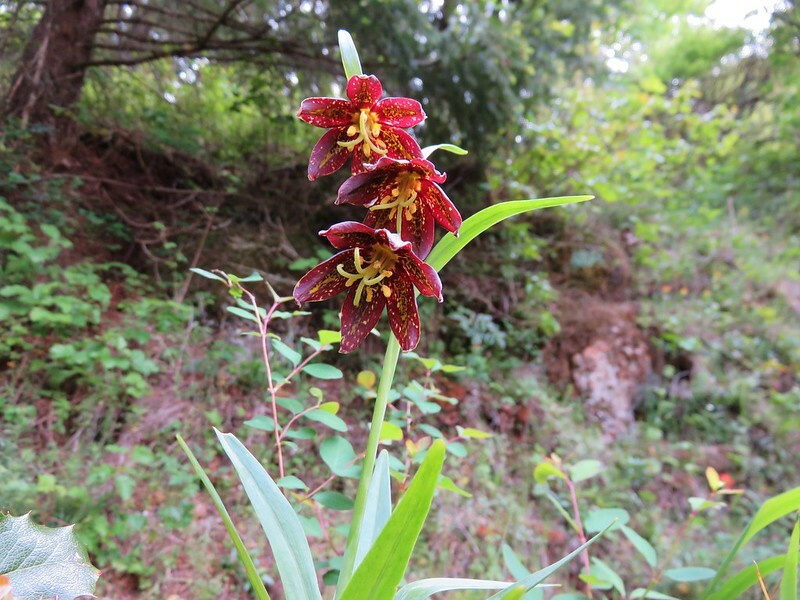 The meadows were filled with various wildflowers creating a colorful display and many plumes of beargrass stood at attention along the meadows edges. 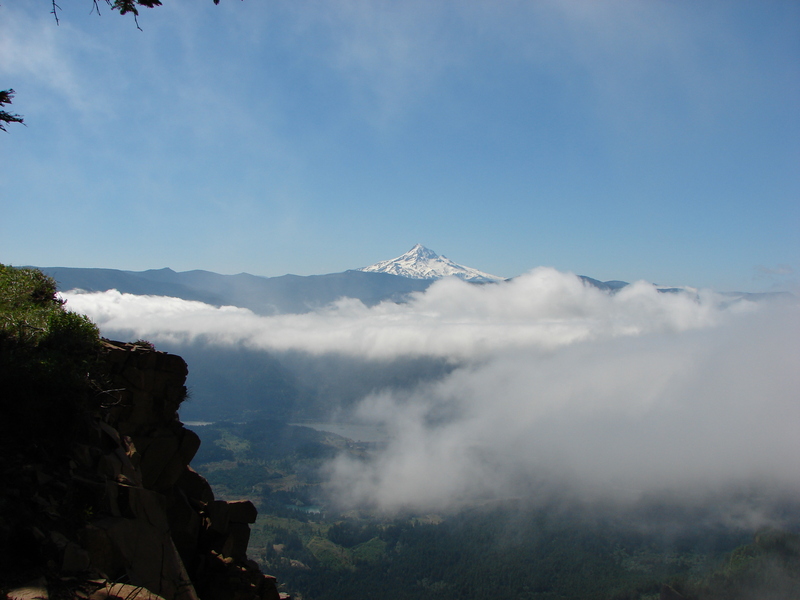 As we headed south along the summit trail toward the viewpoint at that end a faint window opened in the clouds and there stood Mt. Hood. The clouds had begun to slowly break up and by the time we reached the viewpoint better and better views were opening up. We could now see Mt. 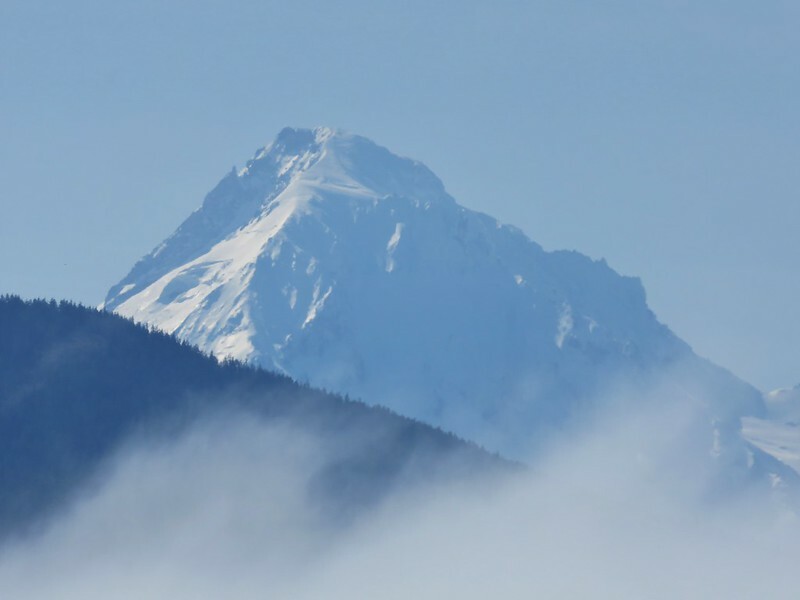 Hood and the tip of Mt. Jefferson at times. 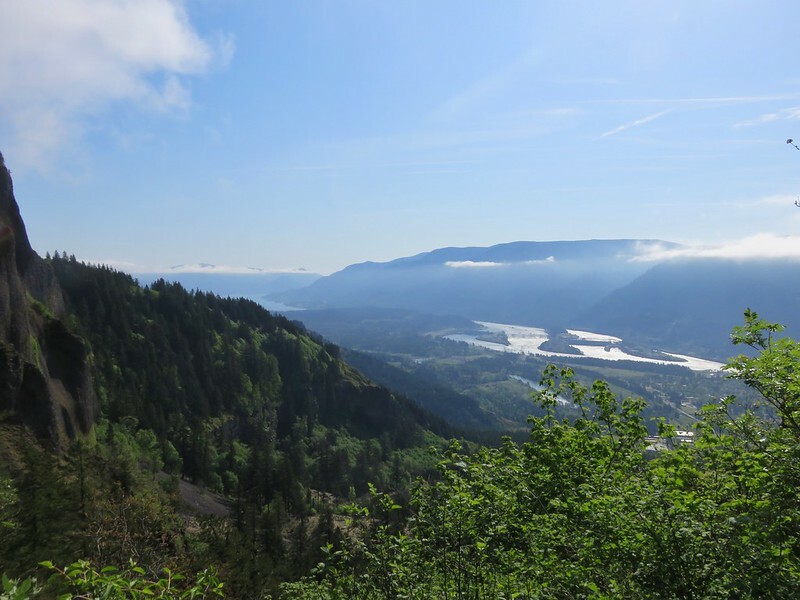 Below we could see the Bonneville Dam on the Columbia River and the Heartbreak Ridge trail as it crossed the viewpoint saddle. We spent awhile here waiting for the openings and then headed back down the trail to find a spot for lunch. We chose a spot that offered a view to the north and east in addition to Mt. Hood to the south. As we ate glimpses of Mt. Adams and Mt. 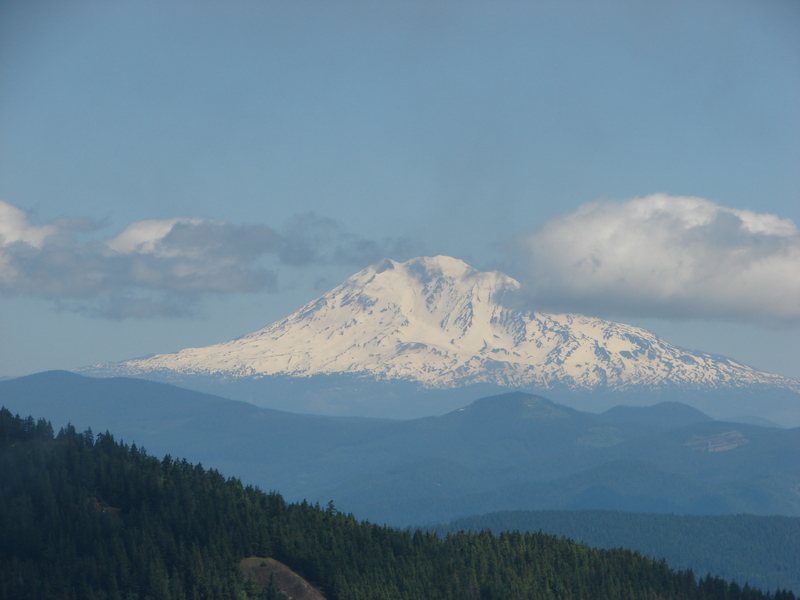 Rainier began to appear. We eventually traveled further north on the summit loop to a second viewpoint at that end. 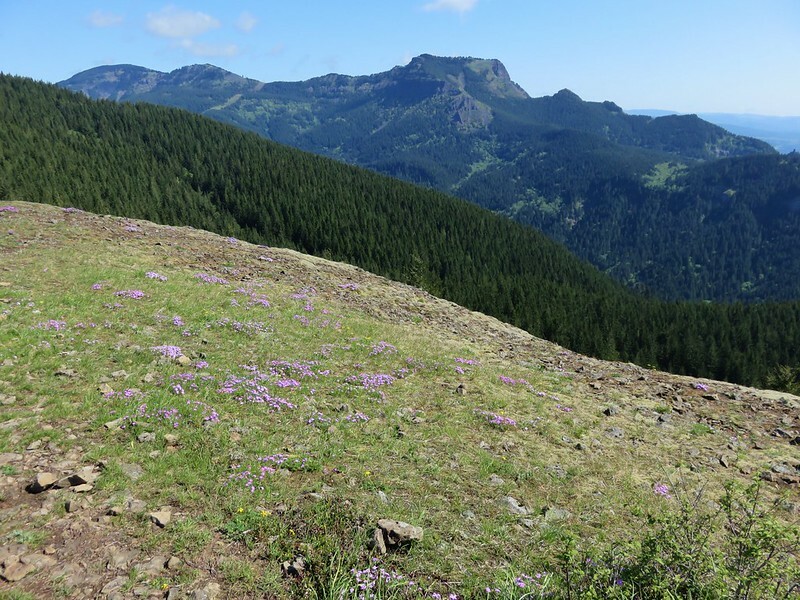 There we discovered a beargrass meadow and ever improving views of Mt. Adams, Mt. 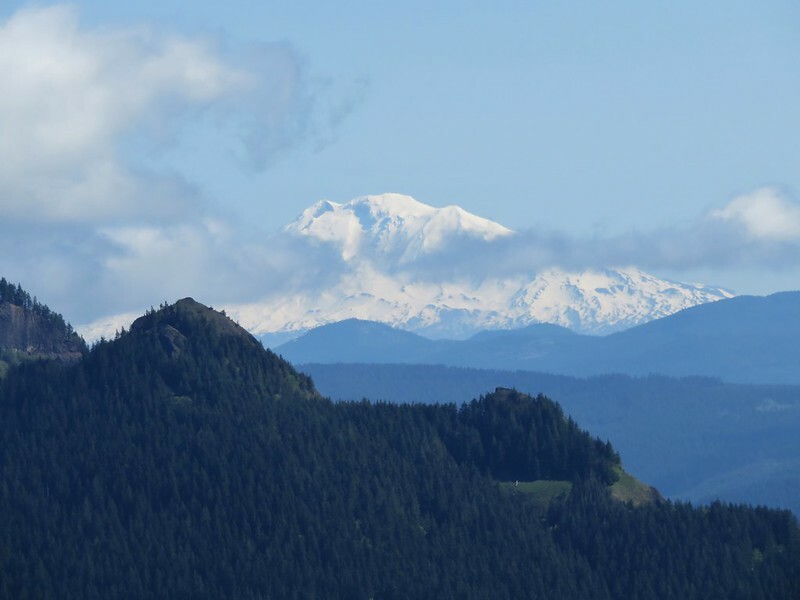 Rainier, and also the rim of Mt. St. Helens. We never quite got a clear view of any of the Washington peaks due to a pesky line of little clouds but after getting our fill of the view we headed down the west ridge. 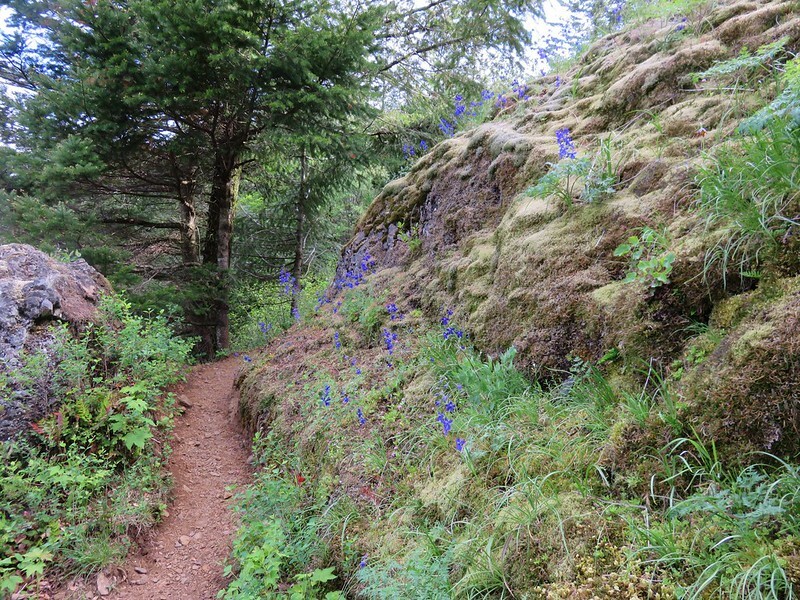 This trail was almost as steep as it made its way down and contained a lot of loose rocks. 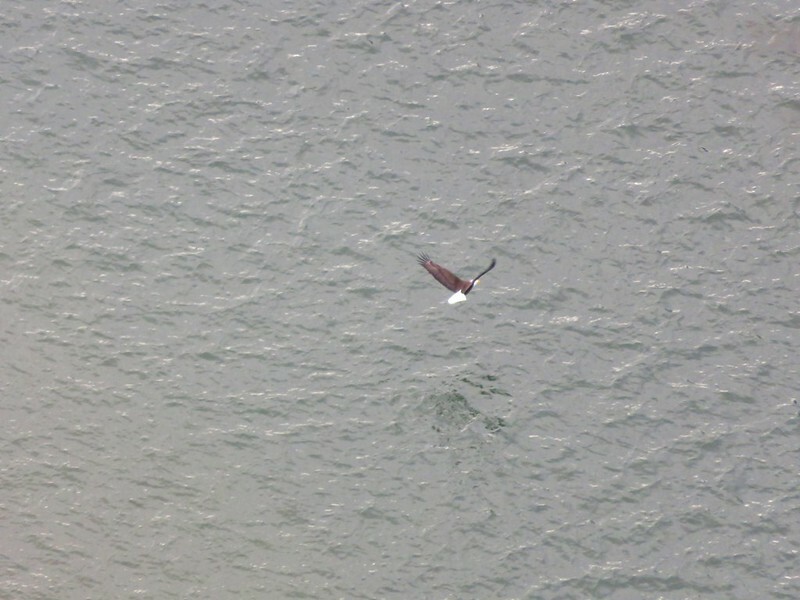 In addition it traveled close enough to the edge of the ridge that anyone with a fear of heights might really have a hard time. That being said the views from this trail were great. Mt. Hood lay ahead while behind was Table Mountain and the rock slide we had scrambled up. The going was slow but we eventually made it down to the PCT. 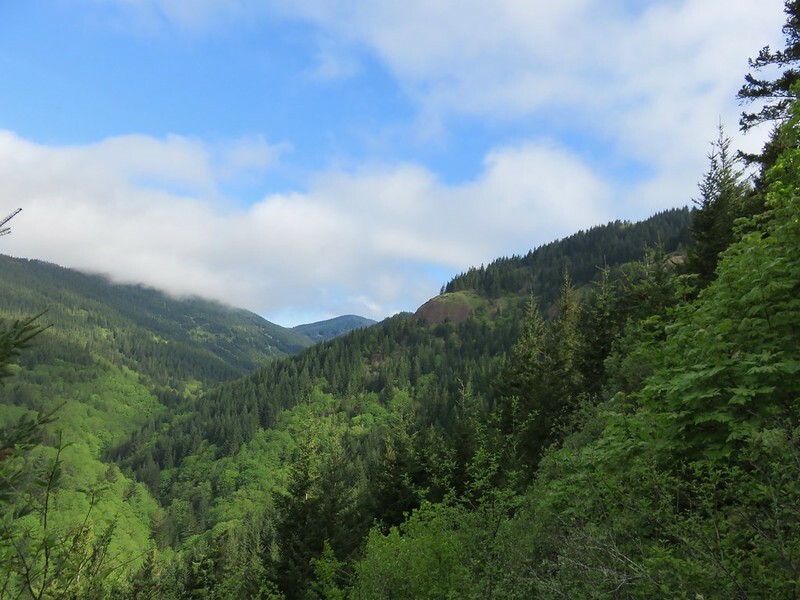 I had no takers when I asked if anyone wanted to go around again when we reached the Heartbreak ridge junction so we returned to our car satisfied with the days views and ready to plan our next adventure. Happy Trail.